FREE Hershey’s 6 Pack w/ Coupon! Dollar General has Hershey’s 6 packs on sale for $1 each. 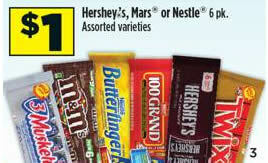 Use this $1/1 Hershey’s milk chocolate bar coupon to get one (or 2!) for FREE! Sorry, we are currently out of prints.